format 21 by 15 cm, book in paper-covers, coloured cover, tissue-paper dust jacket, 508 pages, 16 black and white reproductions. 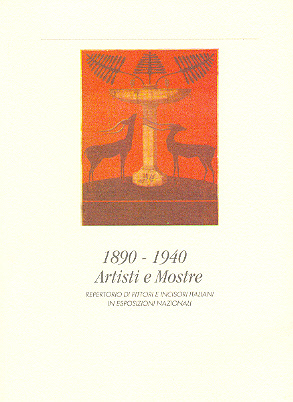 Italian artists from the most important national exhibitions from 1890 to 1940. 10.000 painters and engravers, 67.000 visitors and 430 exhibitions.